Moreover, to cater to the diverse requirements of customers, we offer our range in variegated specifications at market-leading prices. We have constructed a multifaceted infrastructure at our premises to carry out the business operations in a swift manner. This facility is empowered with latest machines and advanced technology that are essentially required in the manufacturing process. Also, we have developed a capacious warehousing unit for safe & systematic storage of the offered range. Apart from this, we have recruited a competent team of professionals, which helps us in offering an impeccable array of products to clients. Post-production, our quality controllers stringently inspect the offered range on certain parameters so as to ensure its flawlessness. Furthermore, our logistics personnel make sure that the consignments are delivered at clients' destination within the stipulated time-frame. Due to these reasons, we have build a vast customer-base across the globe and especially in the markets of Indian Subcontinent. We export and import our valuable products in the following countries like Madagascar, Mauritius, Sri Lanka, Dubai, Nigeria, Kenya, Tanzania, DRC, Sudan, Uganda, Ethiopia. 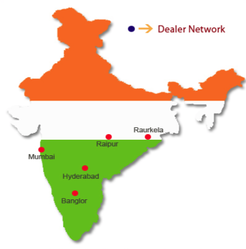 Over 30 % of the dealers from the network are exclusive to us. And we enjoy an excellent rapport with them. We have established a state-of-the-art infrastructure facility at our premises for streamlined execution of the business processes. Spread over an extensive area, this facility is installed with latest machines & advanced technology that enable us to utilize the resources in a judicious manner. Owing to the excellent production rate of our infrastructure, we have been able to cater to the varied requirements of customers. Moreover, we have hired highly experienced professionals to manage this facility. We are greatly supported by a dexterous team of professionals in all the activities of our trade. The sincere, dedicated and hard working professionals working with us are masters of their respective fields of specialization. These experts employ their in-depth knowledge and vast industry experience to successfully accomplish the assigned tasks. Moreover, our employees work in close proximity with each other to achieve the organizational goals in an effective & efficient manner. Besides, we arrange training sessions & workshops at regular intervals to enhance their skills & knowledge.